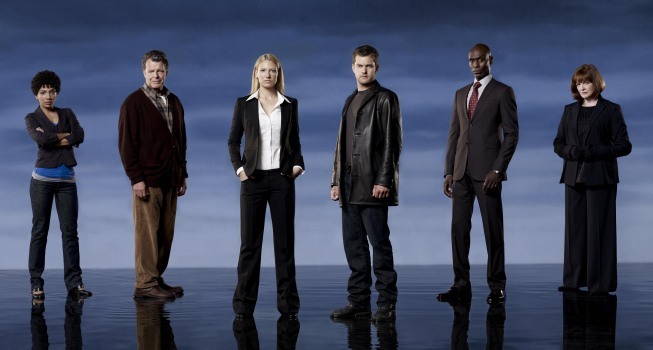 As seems to happen with a lot of series, Fringe didn’t find its footing straight away. It appeared to be a half-hearted X-Files rip-off, with science that stretched believability to the breaking point and with a less charismatic cast. The first episodes focus on the formation of the Fringe team. Agent Olivia Dunham (Anna Torv) gets drafted into the Fringe division of the FBI, looking into events that seemingly defy explanation. Borderline crazy scientist Walter Bishop (John Noble) is picked to aid her, who is looked after by his son Peter (Joshua Jackson) and assisted in the lab by agent Astrid Farnsworth (Jasika Nicole). Olivia’s boss, her FBI partner and a shady lady who runs the Massive Dynamic science corporation complete the main cast. Initially the series jumps from strange event to strange event without quite making connections between them, while awkwardly handling its leads. Tradition seems to demand romantic tension between Olivia and Peter but it’s barely there. Peter and Astrid aren’t given much to do, Walter seems a collection of tics and oddness in need of a personality, Olivia is a little flat and her FBI colleagues don’t register much either. The pseudo-science occasionally leads to prolonged bouts of eye-rolling. Example: in one episode Peter succeeds in playing back sound waves supposedly caught in a slightly melted window, forming grooves like those on a record. He is able to recover an actual conversation this way, while the weary viewer just shakes his (or her) head in utter disbelief. Just as I was about to bail on Fringe, it hooked me and reeled me back in. An overarching plot, which had previously only had been hinted at, comes to the fore near the end of season one and saves the day. As it turns out, there is an alternate reality that has dubious intentions with our version, for reasons too spoiler-filled to get into. This new revelation is spun in such a way that Peter becomes a pivotal part of the plot and Walter becomes a more complex and sympathetic – if very flawed – character. Olivia’s personality gets fleshed out as well, as she discovers a unique aspect of herself. Alas, Astrid still remains a bit one-dimensional until well into season two; no wonder Walter always has trouble getting her name right. Because of the extra layers that the alternate reality story arc brings to the interpersonal relationships all around, the crew starts to feel more cohesive, almost like a family, which allows viewers to emotionally invest in the series. I am currently watching the first half of the third season and the set-up is creative and interesting: each week the show jumps from one of the two warring realities to the other. So one week will tell a story in ‘our’ universe, the next in the other, then ours again, then the alternate and so on… It is without a doubt the best string of episodes so far. To the relief of fans, Fringe was recently picked up for a fourth season. It was touch-and-go for a while, as the series is struggling in the ratings; the amount of back-story and the playing around with alternate versions of the main characters is the best part of the series, but may also baffle someone who is tuning in for the first time. It will be interesting to see if the show drops some of the more complicated plotlines in order to survive or will continue along the road it is on, focusing on the dedicated fans. The second route would have my preference, as long as the story ultimately gets finished and is not suddenly cut off, as happens all too often with endangered television series. Fingers crossed that Fringe gets to tell the full story it was created to tell.